Macy’s executives are not happy with the way the 2015 holiday season went. The company reported that its stores suffered a significant sales decline during the holiday season. Sales at stores open at least a year fell 4.7 percent in November and December, compared with the totals reported during the same period of 2014. According to figures from the MasterCard SpendingPulse, holiday spending overall was up 7.9 percent for the season. Macy’s CEO Terry Lundgren blamed the sales decline on unseasonably warm weather and lower spending by international tourists. Roughly 80 percent of the sales decline could be attributed to the lack of sales of such as coats, sweaters, boots, scarves and other cold-weather gear. 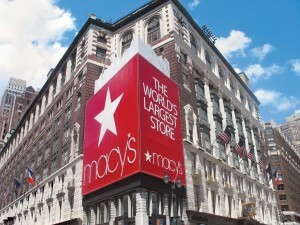 Macy’s was forced to step up discounts to clear out mounds of unsold merchandise. The company currently operates approximately 770 Macy’s and Bloomingdale’s stores. As part of a restructuring plan to turn around the stores’ slumping sales, Macy’s has announced that it will eliminate more than 4,500 positions throughout its organization. About 3,000 associates will be affected across its stores, offices and a call center. An additional 600 back-office positions will be eliminated as well. Roughly 165 senior executives who meet certain age and service requirements will be offered a “voluntary separation opportunity.” Macy’s is in the midst of closing 36 stores, first announced last year, and plans to close one of four credit and customer-service centers in the spring. Macy’s reported that it now expects its profit for its fiscal fourth quarter and full year to fall short of its previous estimate. The company is estimating fourth-quarter earnings per share at $2.18 to $2.23, considerably lower than the average analyst estimate of $2.56 per share, according to FactSet. Macy’s had previously anticipated earnings per share at $2.54 to $2.64. For the full year, it now expects a profit range of $3.85 to $3.90, down from $4.20 to $4.30 per share.